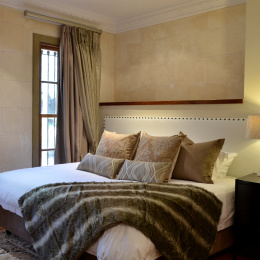 Combining the charm of a French Provençal villa with contemporary comfort, AM Milner Guest House is a chic boutique hotel located along a peaceful, jacaranda tree-lined avenue in the upmarket Pretoria suburb of Waterkloof. Characterised by the beautiful jacaranda trees that burst into violet bloom in late spring, and exclusive private homes favoured by ambassadors, diplomats and other eminent residents, Waterkloof’s graceful surrounds, yet close proximity to the Pretoria city centre, make it a sought-after destination with both executive and leisure travelers. Originally a private residence built in the style of a French country home, AM Milner Guest House was remodelled to create a sophisticated haven for discerning guests, retaining many of the original features, while incorporating modern interiors and amenities. Comprising a main house and separate cottage, AM Milner Guest House features seven bedrooms, an elegant lounge warmed in the winter by a fireplace, and an exquisite dining room where the executive chef serves up culinary delights to house guests, gastronomic aficionados, as well as for intimate corporate and social functions. A number of tranquil outdoor seating and reclining areas are tastefully arranged around the large swimming pool behind the main house. The pièce de résistance is the enchanting garden, an unexpected discovery beyond the entrance gates. In keeping with the style of a grand French villa, a gravel driveway flanked by stately oaks leads up to the main house and a pretty fountain, setting the tone for the gracious hospitality that awaits visitors to AM Milner Guest House. A row of tall, fragrant firs borders the large estate, alongside a manicured lawn, the ideal setting for a small function. The gardens are awash with colour and foliage, and are further complemented by koi ponds. Most rooms have private patios or balconies to make the most of the picturesque, peaceful setting. Whether you’re looking for an exclusive venue with a touch of glamour for a romantic city break, a corporate short or long-term stay, an executive meeting or intimate function, AM Milner’s sophisticated, yet relaxed residential feel provides a welcome alternative to mainstream hospitality establishments.